Crete Senesi means "Siennese clays" and these give the soil of parts of the Val d'Orcia south east of Sienna a distinctive grey colouration. This characteristic clay, known as mattaione, represents the sediments of the Pliocene sea which covered the area between 2.5 and 4.5 million years ago. Erosion of the soil has played a major role in the formation of the landscape, with the clay laid bare and forming craggy badlands known as calanchi and clay knolls called biancane or mammelloni. This amazing landscape, dotted with Tuscan farm houses, castles and ancient villages is a photographers' paradise and should not be missed by anyone visiting southern Tuscany. 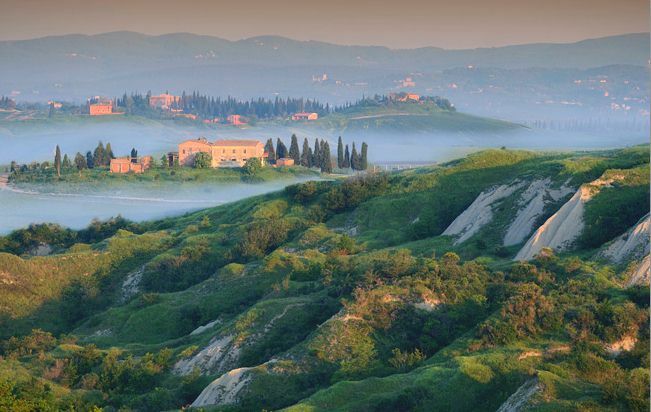 The main centre of the Crete Senesi is Asciano, a well-preserved mediaeval village. The Basilica of Sant’Agata contains works by Signorelli and Sodoma, while the gothic Church of San Bernardino houses the Museo Etrusco. The ewes' milk of Asciano is provided by sheep that feed on the scented bushes of the Crete, and it is said that this adds the the excellent flavour of the local pecorino (ewes' milk cheese). The area around San Giovanni d’Asso, which is the oldest hamlet in the entire Crete Senesi region, produces black truffles as well as the sought-after and costly white truffle. A truffle market fair is held here in November and the cellars of the ancient castle house a Museo del Tartufo (truffle museum).